This entry was posted on February 29, 2016 by Texas Safety Supply. Gatorade Powder with added Water can help employees exposed to the hazards of heat stress and dehydration. Proper Hydration must be maintained and water and products like Gatorade Powder should be made readily available so that employees can drink as needed. Everyone is a little bit different and some can tolerate heat more than other. Preventing or limiting intake of fluids or breaks is not the answer. The answer is to limit exposure and maintain hydration through liquids, preferably water and Gatorade powder with added water. Purchasing Gatorade powder in bulk powdered form makes it easy to transport to job sites. Makes it easy for Supervisors to add ice and water so that Gatorade can be readily available on those hot humid days. Texas Safety Supply has large inventories and selections of Gatorade powder for purchase with shipping included to your facility or to your job site included in the price. Employees working in the heat require a sufficient amount of nutrients and energy level to keep up with the industry intensive tasks. Gatorade Powder is found to be a great solution to this concern of various industrial workers. It keeps them hydrated and energy boosted. Gatorade Powder usually consist of energy efficient components like sucrose and fructose that are the natural form of glucose. While fructose can be a concern of digestion, sucrose gets easily digested in the liver and becomes glucose in the bloodstream which in turn provides a tremendous energy boost to the body. Gatorade Powder is usually the carbohydrate blended with the dextrose. The final product in which it converts inside the body is glucose. It has a great impact on blood sugar level when taken in adequate amount. 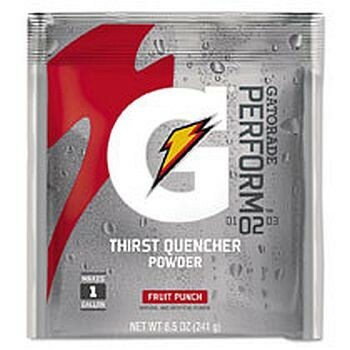 Even sports person and marathon runners use the powdered gatorade to boost the energy level on the ground. While there are various brand that make it, you should be aware enough to choose the right brand and gatorade type. Gatorade Powder Powder can be easily carried and used in the emergent condition. The carbohydrate stored in the body serve the energy but it takes a lot of time to convert into the energy form. Powdered gatorade does the same work instantly to maximize the performance. It is also counted among the superior beverages. Gatorade also contains certain amount of magnesium and calcium that are required for proper muscle functioning. People should not consume Gatorade Powder thinking that it is the energy formula. However, an adequate amount of dosage on the relevant time is highly suggested especially to those who are engaged in strenuous tasks and jobs. The workers in the factory are often not aware of these drinks and many industries also don't care for their workers. They should spread the awareness among them. The healthy and energised worker is an asset to the industry and the owners should always take care of them. This drink tastes good and functions well in all intense situations.